The GigaWorks HD50 is Creative's top of the line 2.0 speakers. It sounds really good even though it is very compact and lightweight, thanks to its titanium super tweeters and BasXPort™ technology. The HD50i now comes with a dock that allows you to display your video in its full glory on TV and charge and sync content from the computer. 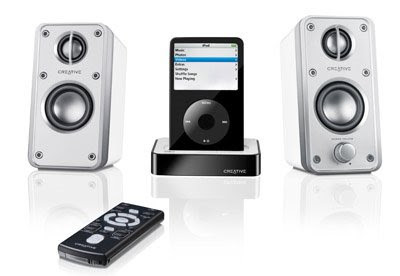 It also has a wireless remote that allows you to conveniently control the music on the iPod. However at USD$199.99, some might find it too pricey for a 2.0 system. Creative have released a number of Made for iPod products over the years. However, I do not see any Apple shop or authorized re-seller carrying the products in Singapore (although I remember reading from one of their press release sometime back that the Apple Store in the US do sell it). Does the Apple shop in your country carry Creative's Made for iPod products? Leave us a comment or better still, take a photo of it in the store! I just know one Apple-reseller around here and they don't sell products from Creative.. But another question: Can the dockingstation X-30 also be used with other speakers? Because on creative's website they say it's just compatible with GigaWorks T40 and HD50. Hmm..